Wowowow it’s been busy!! Wednesday was a day off for me but I spent the morning running errands…then the afternoon being all pissy. Well for part of it anyway. 🙂 I also cooked some awesome spaghetti for the boys and they loved it. I saw the technique on a blog a few weeks ago and decided to make it…what a great idea! Here is a picture of the before and after! 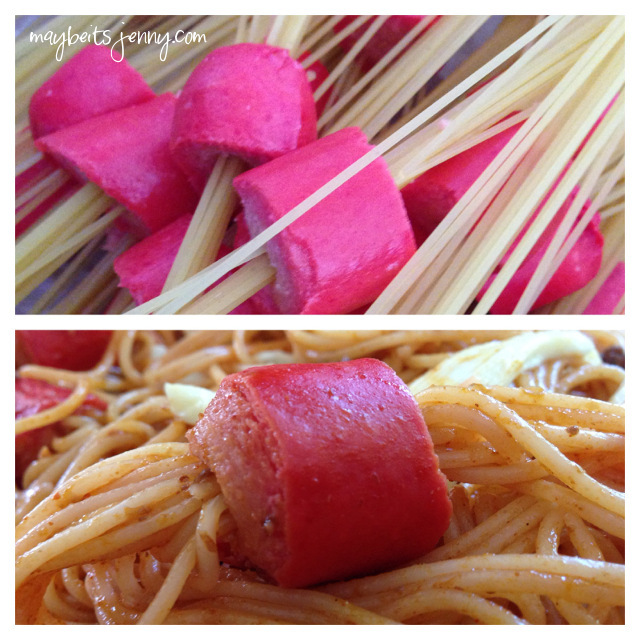 This entry was posted in Food, Recipe and tagged Hot Dog, Spaghetti. ← Happy Sunday Happy Funday! saw the full moon this morning? it’s. amazing. just like this idea. boom. now i wanna try and make this. thank you! hahaha thanks for that kristian. i like see the pics when you do! Boom? How funny ! Haha…. Wonder if you could spear Portuguese sausage this way? But add traditional sauce? So cool. I thought about this after your comment and got excited and then thought..maybe not. I say no only cause you have to boil this in water for a while and I can just see all the awesome juices and flavors of the portuguese sausage going to waste. If you decide to give it a try, let me know how it goes! Hehe wish I could take credit! Saw it on another food blog! I just love how easy it is…and delicious!